A sergeant described as a cop's cop, one who would "go to the ends of the earth" to solve a crime, was honored by family, friends and law enforcement officers from across the country Thursday at his memorial in Southern California. Sgt. Ron Helus, killed when he rushed into danger on the night of Nov. 7 to save others from a shooter inside the crowded Borderline Bar in Thousand Oaks, also was remembered as a devoted husband and father who loved to go fly fishing with his son. 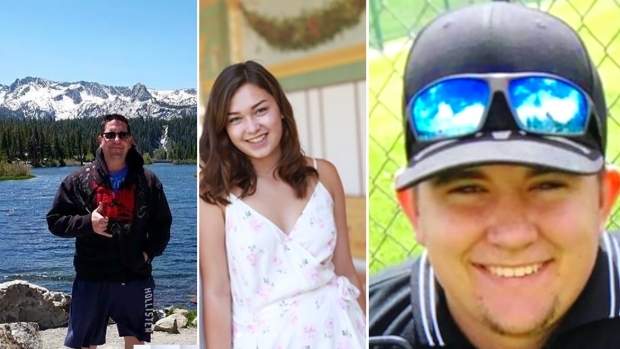 Helus engaged the gunman in a firefight -- a courageous act that would take his life, but ultimately save many people inside the bar for a popular college night event. 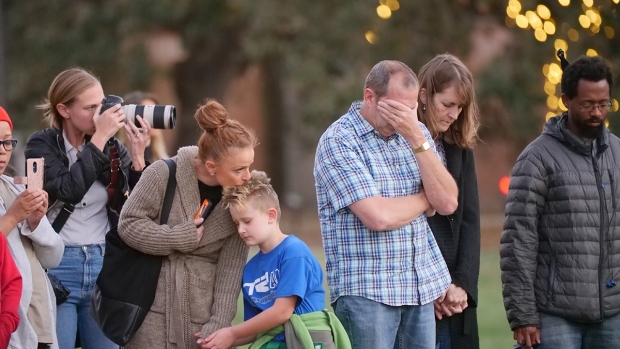 In all, 13 people died, including the gunman, who killed himself. 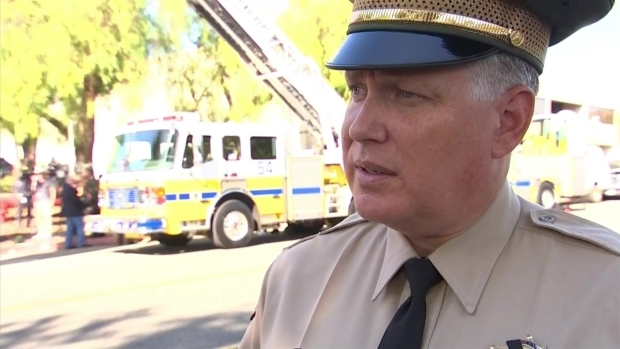 "There's no doubt that they saved lives by going in there," former Ventura County Sheriff Geoff Dean, who retired last Friday, said of the actions of Helus and a California Highway Patrol officer who followed him through the door. Sgt. Eric Buschow of the Ventura County Sheriff's Department talks about what has been a devastating week for the agency. Just hours after the Borderline Bar shooting of his friend and colleague, Sgt. Ron Helus, deputies were called to assist with evacuations forced by a wildfire. Officers stood solemnly at attention, then saluted as an honor guard wheeled in the flag-draped coffin of 54-year-old Sgt. Helus while the song "Amazing Grace" played. The service was followed by burial at a nearby cemetery. "In the last few days, our family has experienced an outpouring of love that is nothing short of inspiring," Helus' niece, Lauren Smith, said during the service. "We are overwhelmed by the level of care and sympathy that this community -- our community -- has shown us. "My family's world has been shaken by the loss of a husband, a father, an uncle, a brother, a nephew, son and dear friend. We mourn with all the others who lost their loved ones. There are many more nights of pain and processing to come; and in those times, we may feel lost, alone, and as though the world is full of darkness. But... we may find comfort in knowing, as Ron did, that this world is only temporary, and that we are not alone." For many members of the Ventura County Sheriff's Department, Thursday was finally a day that could be devoted to the memory of their colleague. Just hours after the tragic shooting, a devastating wildfire began in the Thousand Oaks, forcing evacuations and demanding even more from a department and community already reeling from the mass shooting. "It's the first day that we're able to grieve as a family and pay tribute to Ron because so many things have happened since Wednesday night," said Sgt. Eric Buschow, a friend and colleague of Helus. "It's our first opportunity to come up for air and process this." During the service, the Rev. Charley Maloney of the Camarillo Christian Church read a letter that Helus' wife wrote to her late husband. The two met in an anatomy class and their official first date was Nov. 15, 1987 -- 31 years to the date from his funeral. He proposed to her in Charlie Brown's Restaurant, which would eventually become the Borderline Bar and Grill. "I'm so proud of you, and the kind of person you were. I will miss you and your hugs and our life together. Rest now, sweetie. Save a place up there for me, and I will see you again. Love you forever, Karen." In an interview with "Today," his widow said she will remember him as a hero with a "heart of gold." "I can't bring him back," Karen Helus said. "But you know what? He died doing what he would have wanted to do. And he's in a better place. "He would have said he was just doing his job, but you know what, he is a hero, and I want him to be known for that, because that's what he did. He had a heart of gold. He would've done anything for anyone." Karen Helus was talking to her husband on the phone late that night when he said he had to go. "He said, had to back someone up, and he said he loved me," Karen Helus said. "And, I'm glad that I said I loved him. That was the last time I talked to him." The funeral was in Westwood Village, just a few miles from the Borderline Bar & Grill. It was college night at the popular venue and the place was packed with young people. Sgt. Helus' bravery and decisive action came as no surprise to those who know him best. "The fact that he was the first in the door doesn't surprise me at all," said Buschow, a colleague and longtime friend. "He's just one of those guys who wouldn't hesitate in a situation. "Patient. Calm no matter what. When you call 911, he's one of the guys you want showing up." Helus was a 29-year veteran of the Sheriff's Department who had planned to retire next year. An avid fly fisherman who loved the outdoors, he posted photos of himself and his son fishing on his Facebook page, which since his death has been set to legacy status. At work, he took on many of the Sheriff's Department's toughest assignments, working on the SWAT team and in narcotics and investigations. 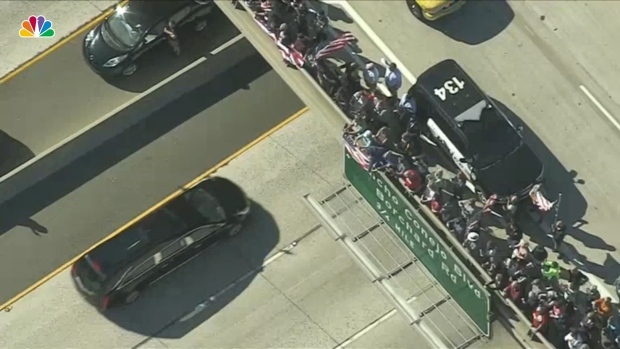 After his death, hundreds of people lined the streets to pay their respects as a hearse carried his body from Los Robles Regional Medical Center in Thousand Oaks to a coroner's office. Many, including medical personnel and law enforcement officers, wept and placed their hands over their hearts as the hearse passed. Firefighters assembled two ladder trucks to hang a giant American flag in Helus' honor over the route. "He served this community way beyond what happened Wednesday night," Buschow added. New Ventura County Sheriff Bill Ayub echoed those sentiments Helus at the memorial. "You may not have known Ron personally, but each of you knew him," Ayub said. "Ron was one we all counted on to protect us in our businesses, our homes, while we go about our daily lives. He was one of us, a member of the community -- a husband, a father, a sheriff's sergeant -- with a tremendous commitment to this community, to keep it safe and to protect those who call this beautiful place home. Helus' memorial was among the first following the Nov. 7 shooting. A funeral was held Wednesday night in Camarillo for another of the victims, 22-year-old Cody Gifford-Coffman, who was shot as he warned others to flee. He was remembered warmly as a man with a goofy sense of humor who loved fishing and baseball. "I am honestly, truly broken," said his father, Jason Coffman. "He didn't deserve it." Helus' survivors include his wife, Karen, and son, Jordan.